UKTV has addedYesterday+1 to the Freeview platform on channel 99 in the Entertainment section of the Freeview channel list overspills below the HD channels. The channelbroadcasts a range of historical and wildlife factual programming alongside prime-time entertainment output, including older comedy series and has been on Freeview since the launch of the free-to-air service in 2002. The +1 channel was previously only distributed on Sky and Virgin. The launch comes ahead of an expected split of UKTV, which is expected to result in UKTV being split between its two co-owners – BBC Studios and Discovery. UKTV’s factual channels are expected to go to Discovery, while the entertainment channels are expected to go to BBC Studios, enabling the BBC to fully control the UK rights to its entertainment programming rights. Yesterday+1 is using the bandwidth previously used by Vintage TV and is available to around 3/4 of UK households on DTT multiplex COM7 using the DVB-T2 standard. If you can already receive BBC News HD on channel 107, you will also be able to receive Yesterday+1 on channel 99. Some viewers may need to retune. 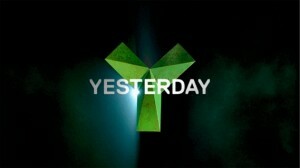 Yesterday+1 is still currently encrypted on satellite and is therefore not available on Freesat.